You can't believe how happy I am with the response I got so far on two of my latest tutorials. The headband tutorial has been a big hit - literally, as it drew a lot of blog readers to my blog and many links have been created to that particular tutorial. It even got translated!! 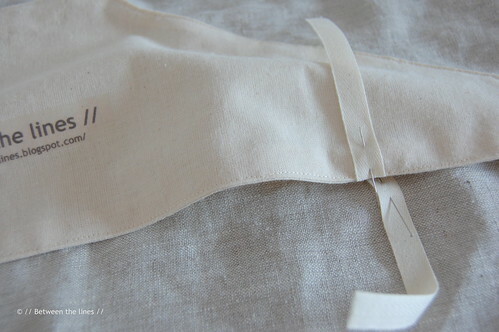 And the French seam drawstring bag has been quite successful too. Thank you everyone for stopping by and liking these projects and for linking and referring! It's nice to know that I put something together which seemed useful in one way or the other to so many of you! That said: I have another tutorial ready for you today! It's a spin-off of the drawstring bag but not quite: a laundry bag. M. is needing one as she'll be going on "classe verte" soon. We just got the list with all the stuff she needs. A fabric laundry bag is one of them, among many other items (the French are really good at putting lists together...really! I mean it!). I couldn't find our usual laundry bag when we left to the mountains two weeks ago and it still hasn't shown up . No idea where it went... But, hey, I can make one, I thought. A fancier one even! 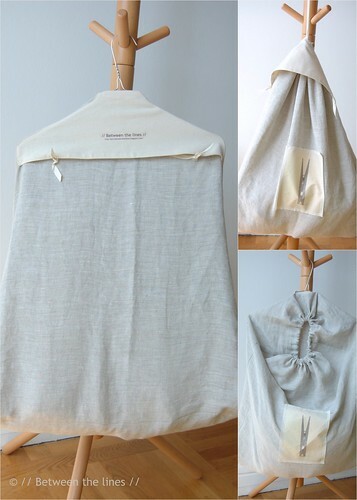 So here's a tutorial for a laundry bag: one bag - three different looks and uses. I won't be going through the steps for making the bag - the bag as such basically boils down to the other drawstring bags I made - I just refer to the french seam drawstring bag tutorial for that part. The fancy thing about this laundry bag is in the details: the clothes hanger pocket in the back. I don't like, when we're on vacation, how our laundry bag always sits on the floor somewhere or tucked away in a closet resulting in everyone just throwing everything on top of it or next to it. So I wanted the new bag to have a "clever suspension system with easy access". So that's why I designed the clothes hanger pocket in the back. That way you can hang the bag either on a hook in the bathroom, in the closet, on a door knob... By putting the clothes hanger pocket not entirely at the top of the bag but slightly lower, the opening becomes easily accessible for tucking away things. And additionally: once the bag's full, you take out the clothes hanger in the back and pull over the pocket so nothing can fall out of the laundry bag. One bag - three uses. Ready? I hope you're still following. - a clothes hanger - I used a metal wire one, like the ones you get at the dry-cleaner's; they're standard and flat so they fit easily in a suitcase if you're intending to use the bag for traveling. As you may have noticed I transferred a picture again onto the bag. This is of course totally optional. If you plan on decorating the bag in one way or the other, do so before you start sewing! 1. 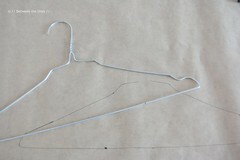 Tape the hanger onto some paper and trace the outlines of the clothes hanger omitting any indents in the hanger, just draw a straight line instead ... Cut out. 2. Pin the pattern onto your double folded smaller piece of fabric - trace the pattern including a 2cm seam allowance all the way around. Cut out fabric. 3. Pin the fabric right sides together. Sew together about 1cm from the edge leaving a small opening at the top for turning. 4. 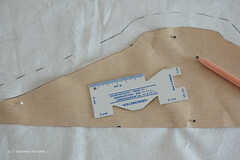 Trim corners and make small cuts perpendicularly to the seam on the curvy parts. Turn inside out, shape and iron flat. Top stitch the top closed a couple of millimeters from the edge. Also, top stitch the bottom. 5. 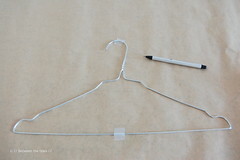 Twill tape binders to secure clothes hanger: Cut four pieces of twill tape of the same length each (7-8cm). And position two of them on the clthes hanger pocket piece at the same distance from the sides near the bottom edge - We'll do the same with the other two pieces on the back part of the bag. (Don't do like what I did: wait till the very end to add these to the clothes hanger pocket...). Sew them into place with a small zig-zag stitch. 6. Position the clothes hanger shaped piece onto what will be the back of your bag - about 15cm from the top (such that after folding in the fabric for making the drawstring tunnel, the top of the pocket will be about 9cm from the top edge). Also, position the two remaining pieces of twill tape perfectly across from the ones on the clothes hanger shaped piece. Sew them on, the same way as you did with the other ones. 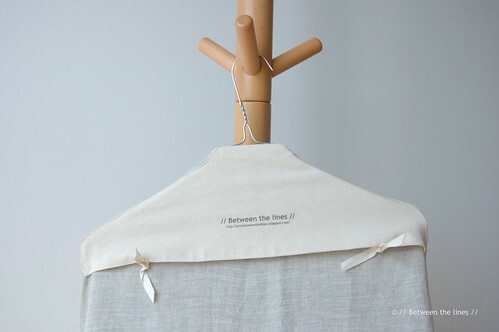 Now, sew on the clothes hanger shaped piece onto the back, leaving the middle top part open and also leaving open the entire length of the clothes hanger at the bottom. So, you only sew the sides!! This will allow you to slide in and out the clothes hanger. 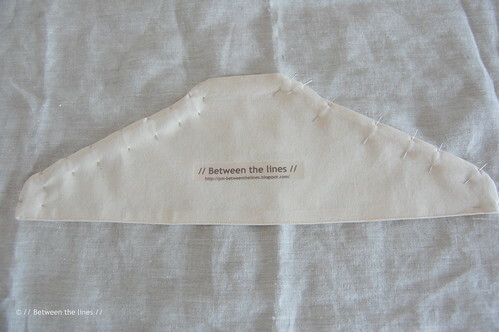 Use a small zig-zag stitch at both ends on each side as that's where the strain will be when the bag gets heavy. 4. Now, continue making the bag as explained in the French seam drawstring bag tutorial, which you can find here. The only difference here being that you have two side seams to sew, instead of one side and bottom seam - everything else remains the same. Though I'd like to make one remark, something that has been pointed out by one of the readers (thanks, Linuxwitch! 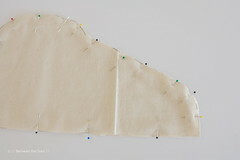 ): in order to obtain a really clean French seam, press the first seam selvages open, then press the right sides together before stitching the second seam. I kind of forgot when I was doing the drawstring bag - too much in a hurry as I had to make three of those! 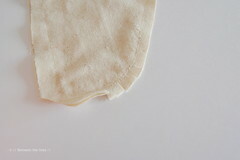 - but you'll see this will result in an even better finished seam! Finally, to make the bag hang nicer, I tucked the corners a couple of inches in and secured them to the bottom of the bag with a couple of stitches. And that's it!! Slide in the clothes hanger, tie two little knots and you're ready!! As usual, if things are not entirely clear or if you see room for improvement, just let me know. Please note, this tutorials is intended for personal use only. Therefore, do not reproduce, sell or commercialize in any form without permission. Thanks for understanding!